If someone were to employ me as a bona fide food critic, I would be at least 350 pounds and confined to a mobile chair. Either that or I would be more of a masochistic exercise freak than I am now. This thought became quite apparent during this last excursion to a restaurant on a quest for sampling only ethnic cuisine. This time, my main ethnic-restaurant-sampling friend and I pleased the palates with some Colombian food. As much bad press as Colombians get for smuggling drugs into the States, someone — we shall say Oprah, for example — should pre-empt such smear campaigns with a plug for Colombian delicacies. Promote positive aspects of Colombia like the food and I guarantee you Colombian drug sales would shrink. Imagine Colombians smuggling tasty food into the United States. Hell, I would meet them at the airport. My friend and I were quite adventurous this time, but not any more daring than usual. I started with a jugo naranjilla — a lulo juice. For those of us who are Jamaican or have been to Jamaica, think June plum. For those who are not Jamaican or who have not been to Jamaica, well, just think of a juice so good that you would risk trying to import the fruit into the States so that you could make your own jugo naranjilla. A lulo is a Colombian fruit, something like a plum that has a pineapple and mango taste to it. Perhaps not, but that is as close as I can get to describing it without wanting to run to O’Hare International Airport, purchasing a ticket, and flying to Columbia for all the lulo juice I can drink. Then again, I can just go back to Las Tablas. Anyway, for appetizers, we had empanadas and aborrajado. The empanadas were corn puff fillets with a mixture of ground meat, potato, rice, and egg. The aborrajado was a perfectly huge, ripe, sweet plantain with guava and melted cheese. For the entrées, we went overboard. I specifically ordered the hostess with a mélange of plantains and salsa served over a bed of rice, after which she came to the table and promptly slapped me — just kidding. Seriously, we feasted on pollo al ajillo, sobrebarriga en salsa criolla, and tradiciones colombianas. Yes, I know that sounds like a lot and my friends and family keep asking me how I can eat as much as I do and still keep the physique of a twenty-year-old fashion model. Just to give you an idea of what each entrée had on it, below is a detail explanation in English and in Spanish. Deliciosa pechuga de pollo asada al carbon en salsa de ajo. Servido con arroz, frijoles, papa y platano frito. Deliciously unique, a plump chicken breast marinated in a freshly ground herbs and spices, grilled to perfection over an open flame plus a touch of garlic sauce served with rice, beans, fried plantain, and potato. Sobrebarriga, papa y yucca en una deliciosa salsa criolla, con platano maduro y arroz. Sautéed flank steak, potato and yucca simmered in a delicious criolla sauce (onions and tomatoes), and served with sweet plantain and rice. Frijoles, arroz, platano, yucca frita, ensalada, aguacate y papa. Beans with rice, plantain, fried yucca, salad, guacamole, and potato. To cap off the evening, we indulged in the usual Latin American after-dinner postres — a flan. This flan was a coconut flan that was so good that I wanted to take off running — for no particular reason other than just to run. That is a problem because food should not make you want to dash out into the middle of the street and do jazz hands, pirouettes, and mariachi steps. Then again, you are inclined to jump for joy when you are in love and I do love to eat. “Food is my lover,” says my stomach, with a Colombian accent. For all the food that we had, I am surprised that the bill did not make the cha-ching sound when the waiter brought it to us. 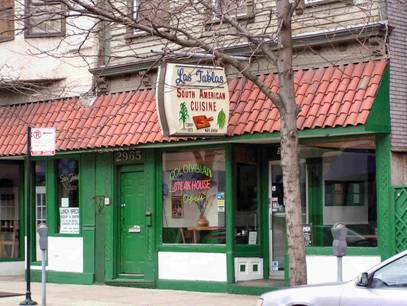 Las Tablas is another restaurant that I will add to the list of recommended eateries in the Chicago area. 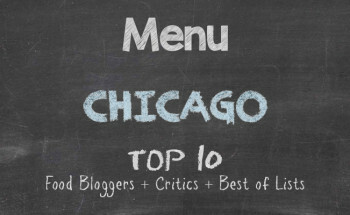 Since we have chosen all excellent ethnic restaurants so far, I thought about inquiring about an awful restaurant so I could sample the food and write a snuff blog. After a second of pondering that notion, taking a bad recommendation could result in a lost friendship. 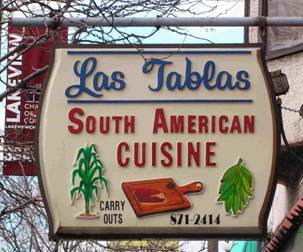 In the meantime, try out Las Tablas if you are ever on the North Side of Chicago and want to please the palate. I highly recommend going early because the later you go, the longer the wait for a table and seeing all the good food going out to the patrons may result in a brawl or your belly growling so loud that it embarrasses you.